Bone spurs are projections of bone that grow onto normal bone. They can develop in dogs for many reasons. Bone spurs are caused when bone tries to repair itself and is not able to do so properly. 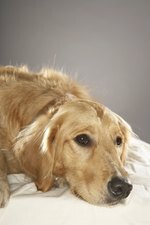 This occurs in canines most often when the pet develops arthritis from old age. There are several other bone diseases that occur in canines that will develop bone spurs in certain places on the body. A way to potentially relieve inflammation and additional bone spur growth is supplementing your pet's diet with glucosamine, chondroitin sulfate and Omega fatty acids. Unfortunately, bone spurs normally do not go away once they have formed, and supplementation can take about eight weeks before providing maximum relief to the soft tissues surrounding the bones. Bone spurs can cause pain for your pet as they press into other body tissue, so seeing a veterinarian to make a plan for pain management is a good idea. Bone spurs are most often come about as a sign on aging in your pet. You may want to consider the discovery of bone spurs as a catalyst to start providing your pet the most comfortable lifestyle you are able.